At the beginning of ‘Quantum of Solace’ James Bond (Daniel Craig) in Aston Martin DBS was chased by criminals in two Alfa Romeos 159. Moreover Italian police joined in on the chase. After evading pursuers 007 drove to Siena. Second unit with director Dan Bradley was working in northern Italy for several weeks to film that 3 minute sequence. First part of the car chase was filmed in April at Lake Garda. Second part of the sequence was filmed near Carrara in May 2008. At the very beginning of ‘Quantum of Solace’ camera was skimming across the Lake Garda approaching the tunnel at the water. It was filmed in northeastern part of the lake. You can see that tunnel in next 3 photos that were taken from the beach at Riva del Garda. Car chase was filmed on the road near Navene on the east coast of the lake and near Limone Sul Garda on the opposite coast. For dynamic shots gyro-stabilized remote-controlled camera crane called ‘Ultimate Arm’ was used. It was attached to the roof of a Mercedes ML55, that was painted matt black to minimise reflections. It could uptain speed 200 kph and the camera could be just inches away from the action during high speed chase. There were several accidents on the set. Especially two of them were described in international publications. Aston Martin employee, who was delivering a car to a publicity shoot for the movie, crashed a £134,000 Aston Martin DBS into the lake. The driver was not hurt, but he had to pay fine for unsafe drive. Completely destroyed car has been later purchased by a collector. Few days later two stuntmen playing villains in Alfa Romeo 159 were involved in an accident. Aris Comninos was in a coma. His co-driver, Bruno Verdirosi, was also treated in hospital. James Bond turned left to avoid roadblock. It was filmed at the intersection of Via IV Novembre SS45bis with Via Benaco SP38 at Lake Garda, near Tremosine. Aston Martin DBS and black Alfa Romeo 159 drove through two short tunnels. That scene was filmed nearly 300 km south from Lake Garda on Via dei Colli, near passo del Vestito, not far from Carrara. Also on Via dei Colli the last scene with Alfa Romeo falling from the cliff was filmed. 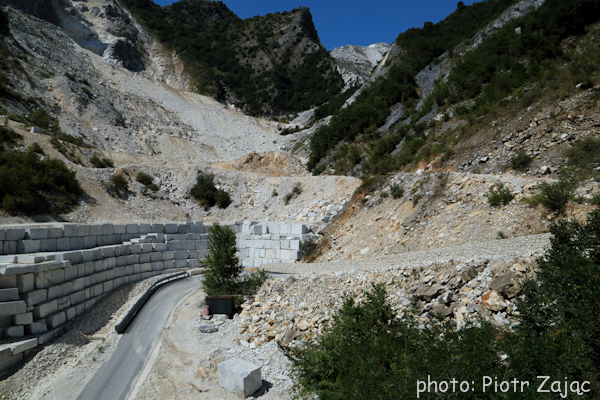 Other car chase scenes were filme at marble quarries near Carrara (see photos below). 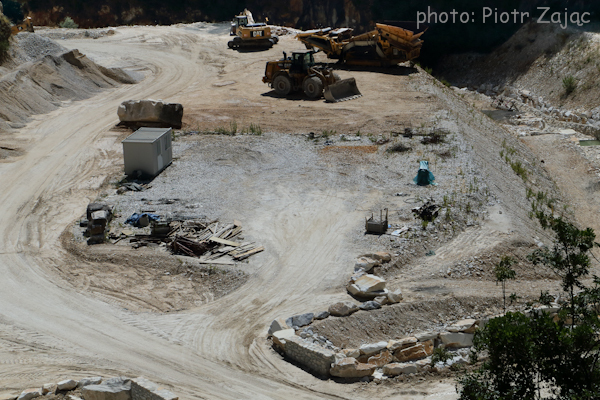 Stunt coordinator Gary Powell said, that they had to change tires in cars when they moved from tarmac mountain road at Garda Lake to marble quarry. There was only one brand of tire for Aston Martin, therefore they had to cut their own treads into the tires. To create the scene seven Aston Martins and nine Alfa Romeos were used. There were also two Land Rovers. The one that hit the building and fell from the cliff had no engine. It was removed and gasoline was taken out so it wouldn’t create unnecessary explosion.